Nigel Barry Allsopp born in the United Kingdom has served in both the New Zealand and Australian Defence Forces. He started his Military Career as a Military Working Dog Handler in the Royal New Zealand Air Force in 1980. Within his 15 years service he rose to the rank of Dogmaster responsible for all aspects of Canine Operations and training within the NZ Defence Force. During his service he was a Military Working Dog Handler, a specialist Narcotic detection dog handler and an Explosive detection handler at various times. He conducted several operational tours of duty including Mogadishu-Somalia and United National postings which are still classified. He was the advisor to Special Forces on Canine operations and , including their use and evasion techniques. He became the first Military Dog trainer to qualify as a Civilian Police dog trainer and supervisor. Nigel has trained numerous Government Agencies such as Customs, Police, Corrective Service and Federal Aviation Security in the use of specialist dogs. Nigel has also trained and supplied specialist detection dogs and Military Working Dogs to South East Asian Countries on behalf of formal Government requests whilst in the Defence Dept. Nigel left the Military to pursue a keen interest in Wild Canine research and commenced work for the Auckland Zoo training all sorts of exotic animals (Primates, Raptors, Carnivores and Native Species) to enhance their Behavioural Enrichment. This included several years as an Elephant keeper whilst also training the zoos Sea lions, Camels and ungulates to promote their natural behaviours. He has written several articles on Behavioural Enrichment of captive animals for International Zoological Journals including the American Elephant Mangers Journal and the Australasian Zoological Journal. He has held several positions with the Australasian Zoological Society as advisor to endangered marsupials including field research, capture and reintroduction into the wild of native species. He returned to Australia to continue his interest in wild canines by working at several zoos and wildlife parks with Manned Wolves, Timber Wolves, Dingoes and African Cape Hunting Dogs. Whilst the Supervisor of Currumbin Wildlife Sanctuary in Queensland, Australia, Nigel was been seconded to various Wildlife Zoos and Parks as an advisor on animal enrichment management including Captive Elephant management at Dubbo Zoo, Marine Mammal enrichment (Polar Bear and Asia Otter) at SeaWorld Australia, Rhino management and Dingo enrichment programmes for Steve Irwin at Australia Zoo. Nigel has appeared on several TV Wildlife programmes such as Jack Hanna’s (USA) and Steve Irwin’s animal series and several International wildlife documentaries. As a lecturer he has taught at Macquarie University on Marsupial captive management and speaker at several International zoo keeping Conferences. Nigel was the Training and Assessment Officer for both the Box Hill TAFE, Victoria and Brisbane TAFE, Queensland, Australia- Zookeepers Certificate level III courses. After a number of years in the Wildlife industry the lure of working with dogs again caused Nigel to join the Queensland Police Service where he is currently a Senior Constable in the QPS Dog Section both operating and training numerous Specialist Detection Dogs for various Federal and State government Departments. Nigel continues to remain involved in K9 Organisations as the Historian of the Australian Defence Force Trackers &War Dog Association. Nigel continues to be a sort after guest speaker on both Working dog and exotic animal training and management. His expertise has been sort on the use of equine transport by Special Force operations in mountainous terrain. 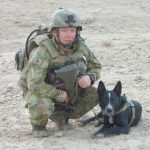 As a published author in the USA and Australasia, Nigel has written several books on War Animals and Police Dogs including the best sellers CRY HAVOC and FOUR LEGGED DIGGERS, K9 COPS, SMOKY THE WAR DOG and ANIMALS IN COMBAT. Nigel has written numerous articles on Canine training for International Law Enforcement Magazines and has been a contributing author to the prestigious British Royal Army Veterinary Corps Journal and other Military journals in the United States. He has been the Canine subject matter expert on TVs Mastermind and appeared on the TV series Who Let the Dogs Out. Peter is a full-time employee of the Toowoomba City Council. Peter has previously served in the Australian Defence Forces. Peter brings to AWAMO a great deal of military expertise and historical research experience. Peter is well known in the local area for his volunteer work with Social Services. Wendy was introduced to the Australian War Animal Memorial Organisation after contacting President Nigel Allsopp whilst doing research, development and design for the Australian War Dogs collectables for her employer SBA Precious Metals Pty Ltd to which Nigel helped with both historical information and private collection photo’s. It was because of this collaboration that SBA became a passionate supporter of AWAMO and chose to donate some of the proceeds from the Australian War Dogs. In early 2015 Wendy saw her passion for animals take a new dimension when she helped to design the Purple Poppy range of products, distributed under the Great Southern Land Collectables range, which includes the now iconic Purple Poppy lapel pin sold world wide. While she does work full time, her employer allows her time to help with AWAMO projects as well as ensuring that donations from sales from the Purple Poppy items are still directed to AWAMO. Wendy brings with her over 30 years of administration experience, a flare for design and a belief that all war animals should be remembered for their heroic deeds and selfless sacrifices. Pam started her career as an entertainer and has received several awards for her singing as well as travelling to the Vietnam War as an entertainer for our troops. Pam is currently Chief Executive Officer at Diggers Services Club and has been at Diggers since 1990. Pam was introduced to AWAMO when the Club installed a War Animal Memorial in early 2015. Pam is very passionate about remembering our returned service men and women as well as the animals of war. Pam is also currently the Secretary of the Board at Diggers and brings with her years or experience and expertise. Shaun brings to AWAMO modern Military war dog skills and advice. 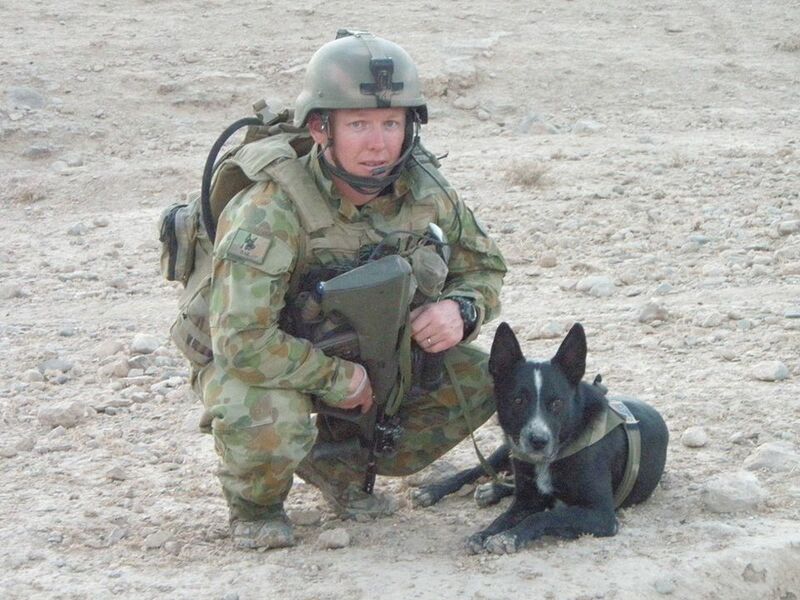 Twice deployed on operations in Afghanistan as an Explosive Detection Dog Handler. He enlisted in the ADF on 20th April 2004 as a combat engineer. Deployed to East Timor in 2006 as a part of defence platoon acting in the Infantry role. He completed his dog course in 2007. Deployed to Afghanistan in 2008. Upon his return he undertook his dog supervisor’s course in 2009. Again deployed to Afghanistan 2010. Shaun discharged from the regular army in 2013, becoming a Reserve in 2 Combat Engineers Regiments EDD Section where he commanded a section during the G20 summit. Peter is a professional rider at the Australian Outback Spectacular were he has been employed since its establishment. Peter has been an active member of the Australian Light Horse Association for over 25 years. Peter is also the President of the Mudgeeraba Light Horse Museum, Gold Coast. Peter is the current President of the Australian Army Veterinary Corps Mounted Troop a part-time re-enactor group. Peter has ridden in the Calgary Stampede on several occasions and is due to lead the AAVC troop display team at Norco USA in July 2015. Santina Lizzio lives in a little township known as Mena Creek, located approximately two hours south of Cairns in North Queensland. She has been employed for the past twenty-eight years as a school officer at St Rita’s Primary School in South Johnstone. She enjoys writing and has successfully published five historical books featuring the local area, two poetry books, two reflective verse books and two children’s books. She also enjoys gardening, antique furniture, collectables and bush-walking. Santina’s poem, “I am a War Dog” won favour with the Australian Defence Force Trackers and War Dogs Association when it was read for the first time in 2009 when medals were posthumously awarded to the eleven dogs who served in Vietnam. She is extremely passionate on the subject of animal welfare, especially those that serve unconditionally and give their lives in service.